Have you ever seen an auctioneer calling out prices for certain furniture, electronics or any other items in a public place and the participant who bided the highest price got the item? That’s what a normal auction process is all about. Auctioneering is a process where various goods and services are bided and later given to the highest bidder. 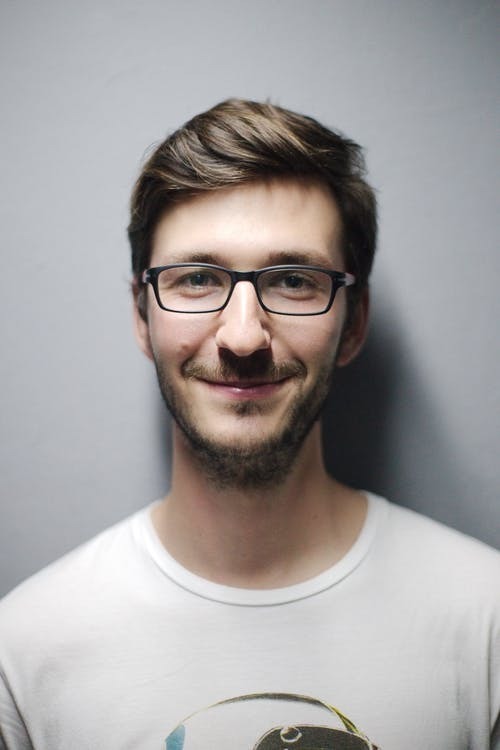 The participants in this kind of auction tend to bid openly against their opponents, and the rule remains that the subsequent bid should be higher compared to the previous one. The auctioneer may decide to call the price after every bid is made and give 3 chances before he releases the product with that amount to the bidder. But do they have to shout out the prices? Is it a must for the participants to bid their prices openly as if they are competing? Well, there are various types of auctions, and silent auction lies in the secondary category. 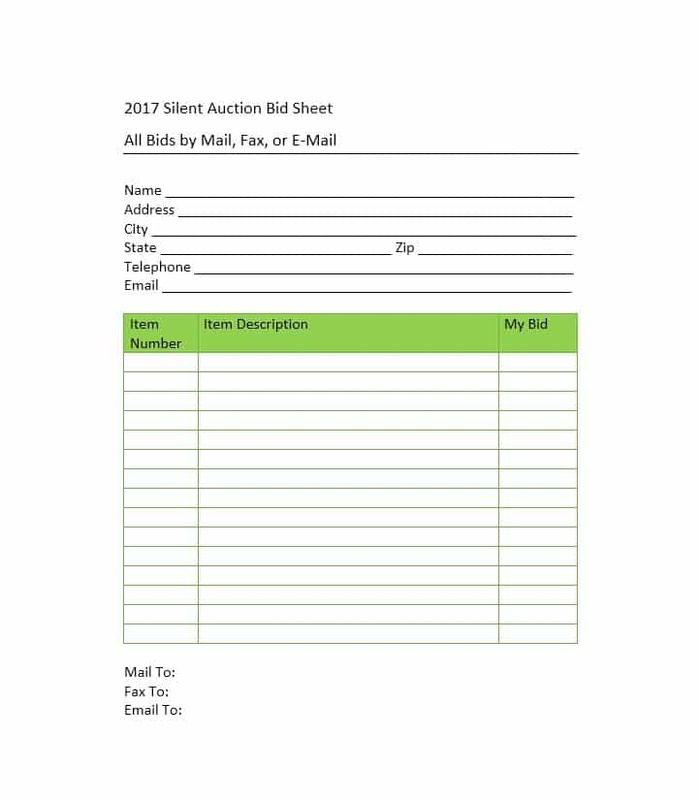 A silent auction is an alternative to the regular auction, but the principle remains the same; the highest bidder gets the item. Let’s sail deeper. 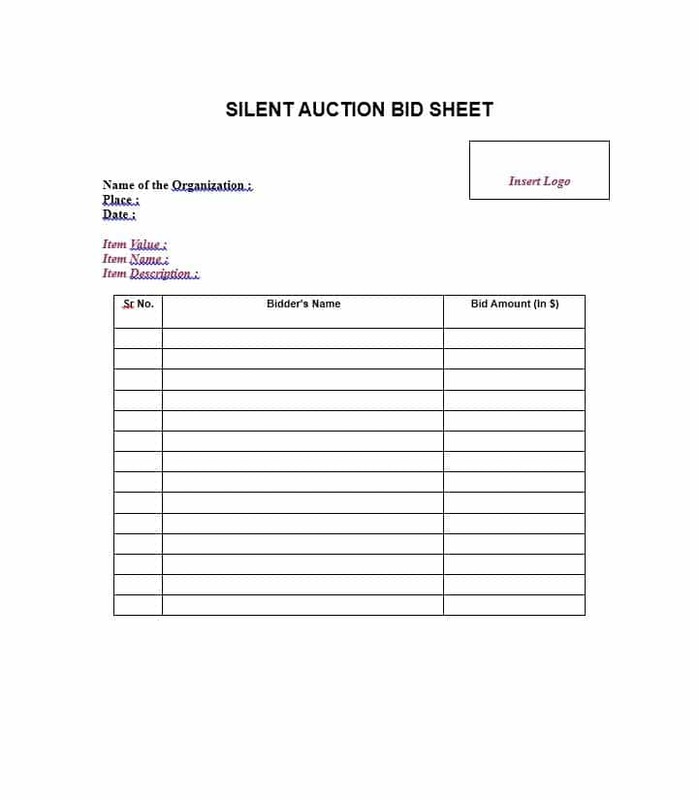 What is a Silent Auction Bid Sheet? From the name, you can tell that this is not about calling out prices and participants answering back. The silent auction doesn’t involve an auctioneer shouting. 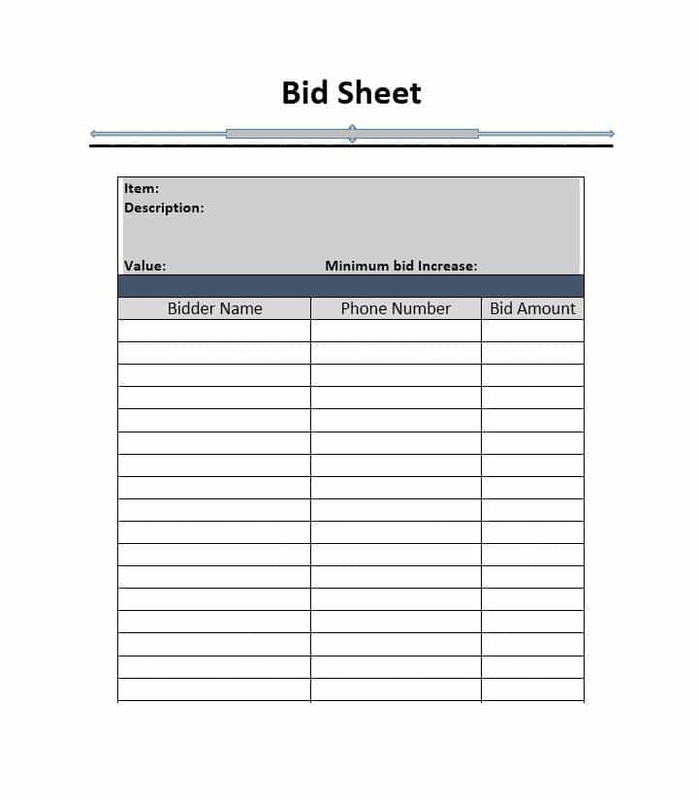 It is a kind of bidding that is done privately on the bid sheet, and later they are examined when all have given their bids and the one who quoted the highest amount is given the item. It is just like that traditional auction, only that you don’t have an auctioneer calling out prices. To ensure the process is free and fair, everyone is given ample time and when it elapses they give back the bid sheet. 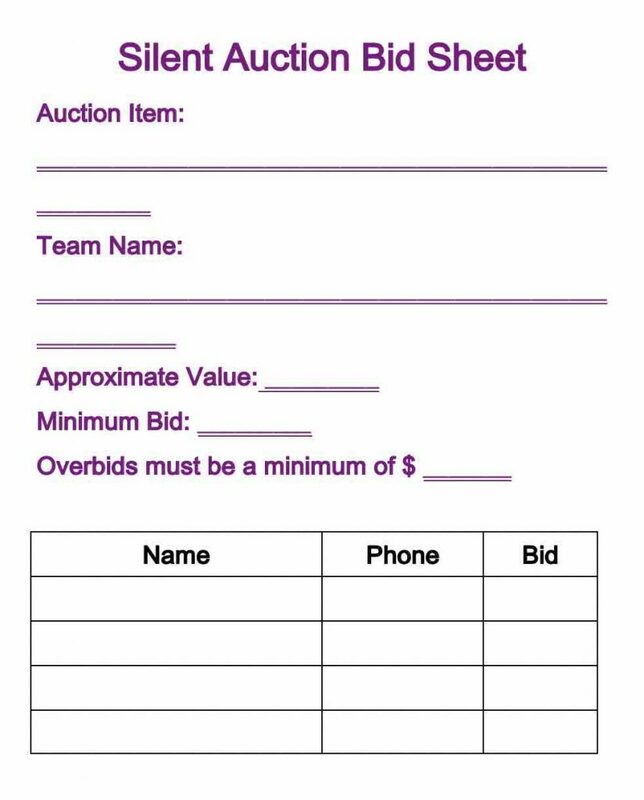 This type of auction is common in charity events where maybe several items need to be auctioned simultaneously. One important document in this auction is the bid sheet which displays all the essential information you need including the starting price. 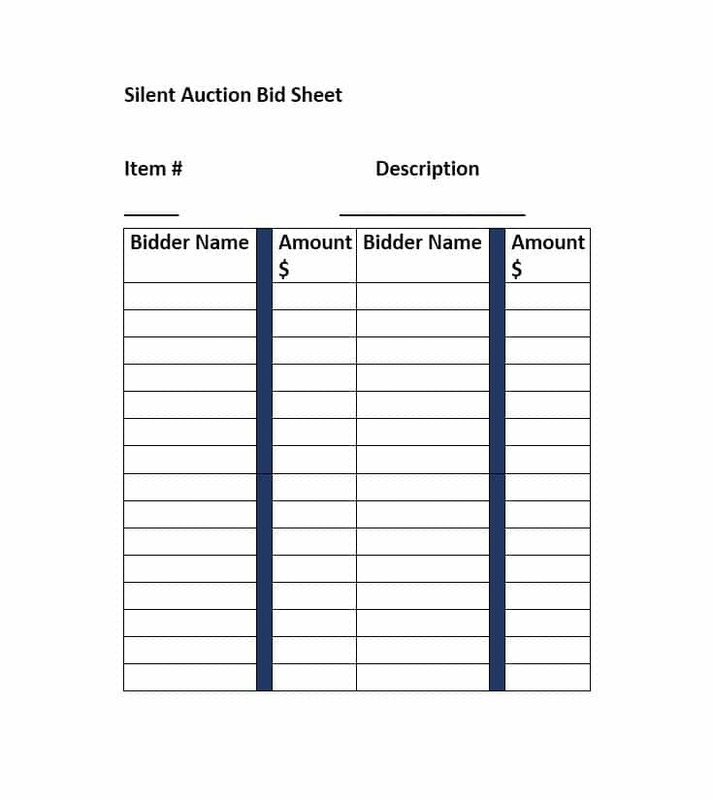 So how does silent auction work? It doesn’t need a fundraising auctioneer hence referred to as silent auction. 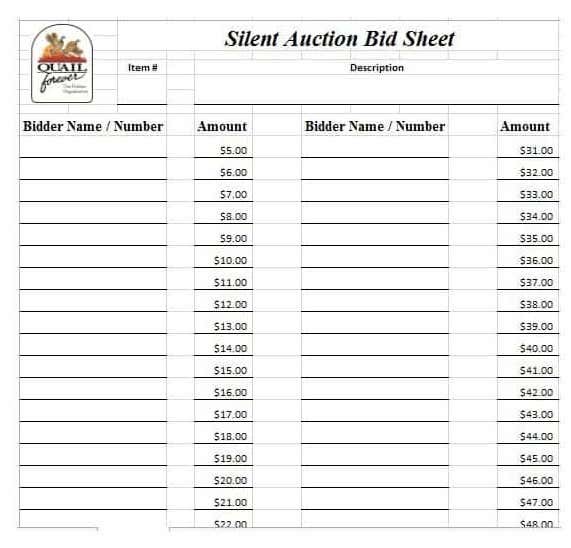 Every participant is given a bid sheet template or what is called a silent auction sheet in accordance with the item which is to be auctioned. 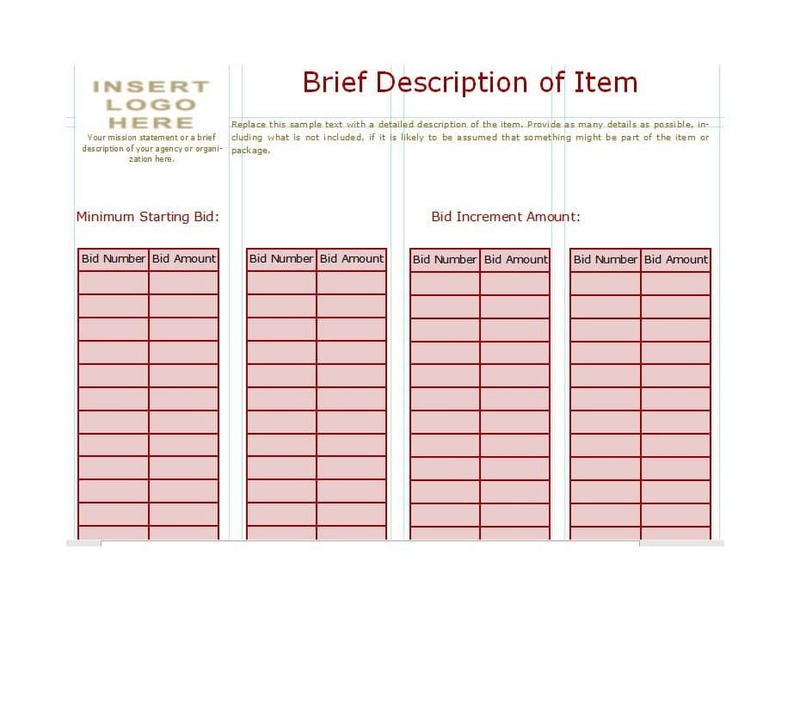 In this bid sheet template, you will find all the important information that you need to know about the item like the starting amount among other details. The bidding is then done silently on the sheet and kept private. This means no participant knows the highest bidder because the auctioneer is not calling out the price. After the fixed predetermined time elapses, the bid sheet is examined and evaluated to come up with the highest bidder who is given the items in an auction. It is not a complicated document to use especially when the template has all that is needed. The silent auction fundraising has some aspects that make it unique for bidders. Let’s have a look at them. 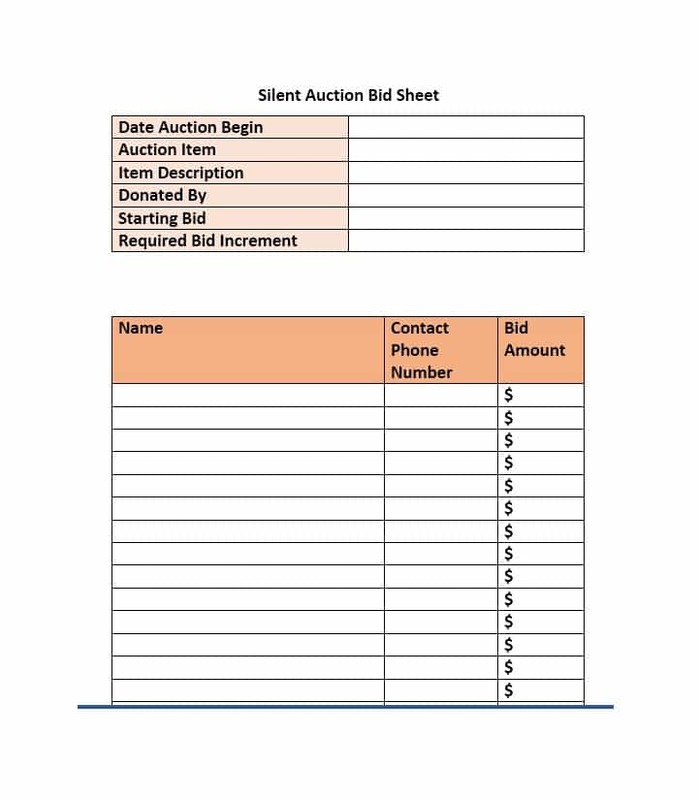 Bid sheet templates – This is one of the most essential basics of silent auctions. This is where the real auction takes place. They contain the item name, a brief intro of the item, its value, its minimum selling rate, and a blank paper where you can take down the notes about the item. 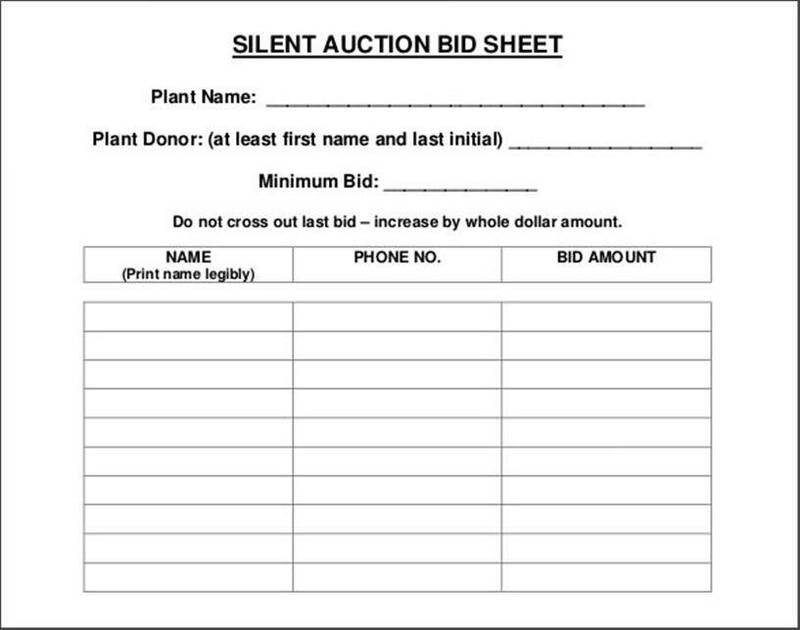 You can use the below to print enough bid sheets for your auction. Collect the items or services – You can get the goods to be auctioned from donors and various organizations. If you can make it in such a way that your money will go to the right charity, then many businesses are very willing to help you with items and/or services. Great item display – You need items to sell to your participants. You should put numbers and even labels on every item to differentiate it from the rest which looks similar. 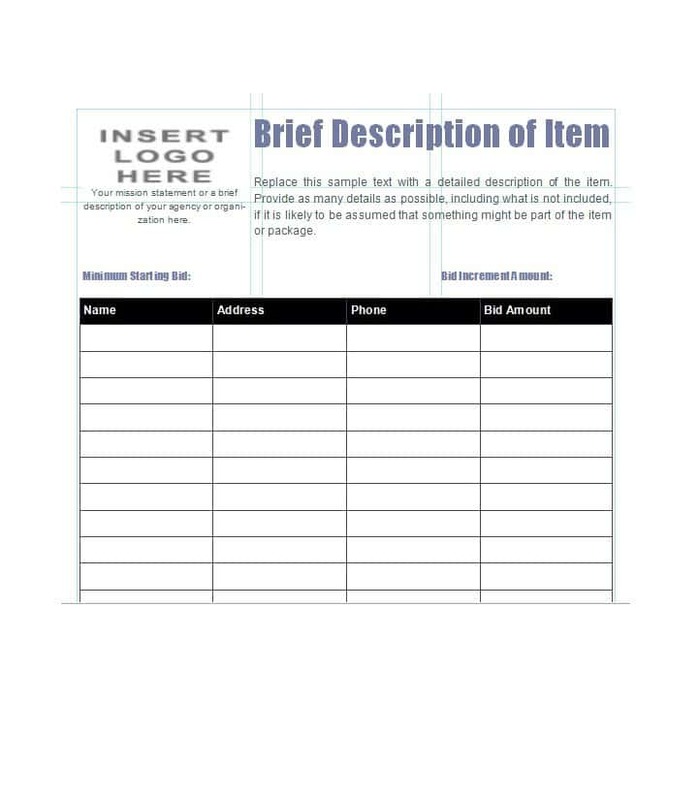 To make the whole process even easier, you can put a similar label in the bid sheet templates. Have all the supplies ready – Don’t go for the silent auction without having the tools you need to make it successful. You need to print bid sheets, have enough papers, pens, clipboards, and tape among others. 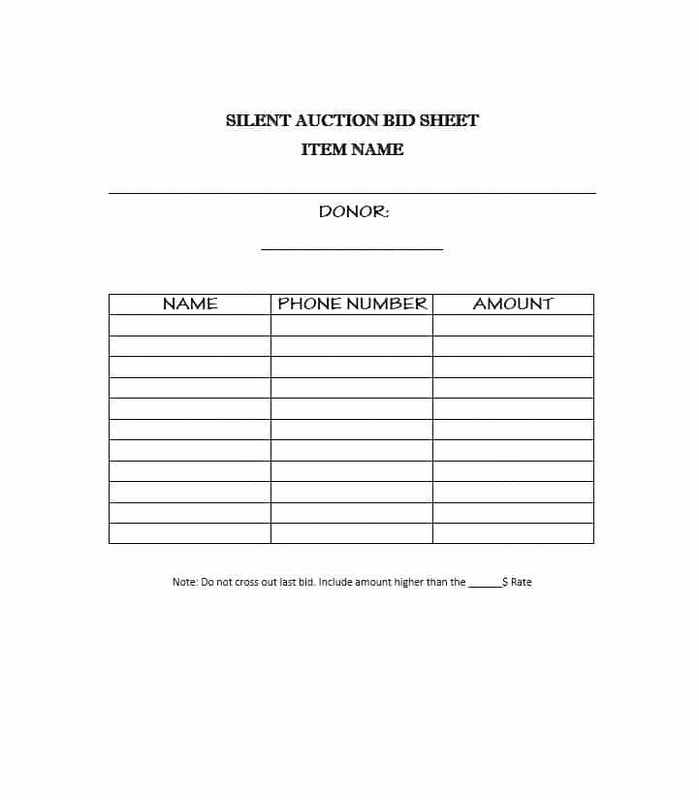 Recruit enough volunteers – Silent auction is known to be a charity-based activity. This means you can easily get volunteers to do the job. However, not everyone should be there. You need them to be aware of the rules and laws of an auction. They should also be dressed officially in distinctive vests, hats or jackets to show that they are officials. 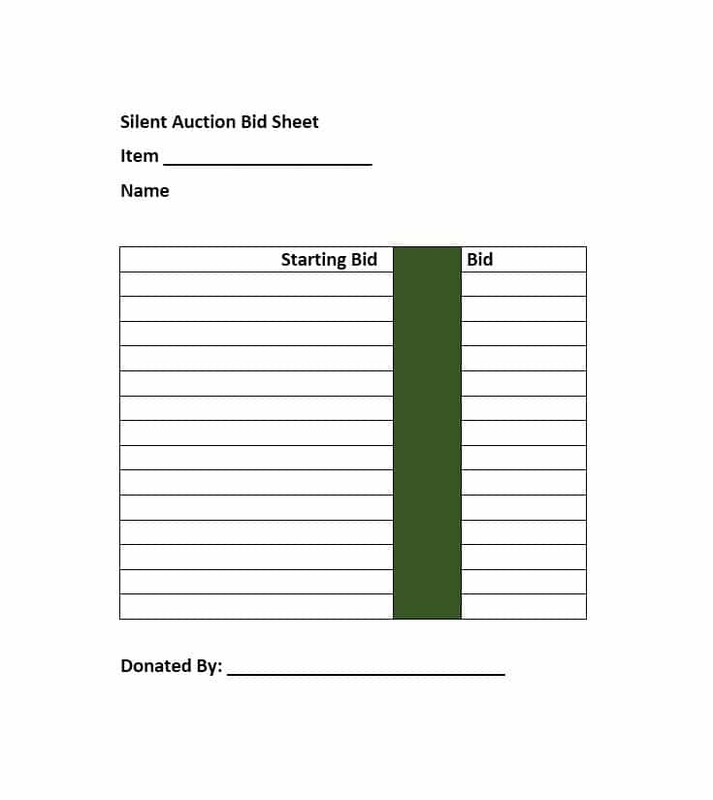 Having known what will make your silent auction fundraising event a success, what should a bid sheet display to make it easier for the participants? 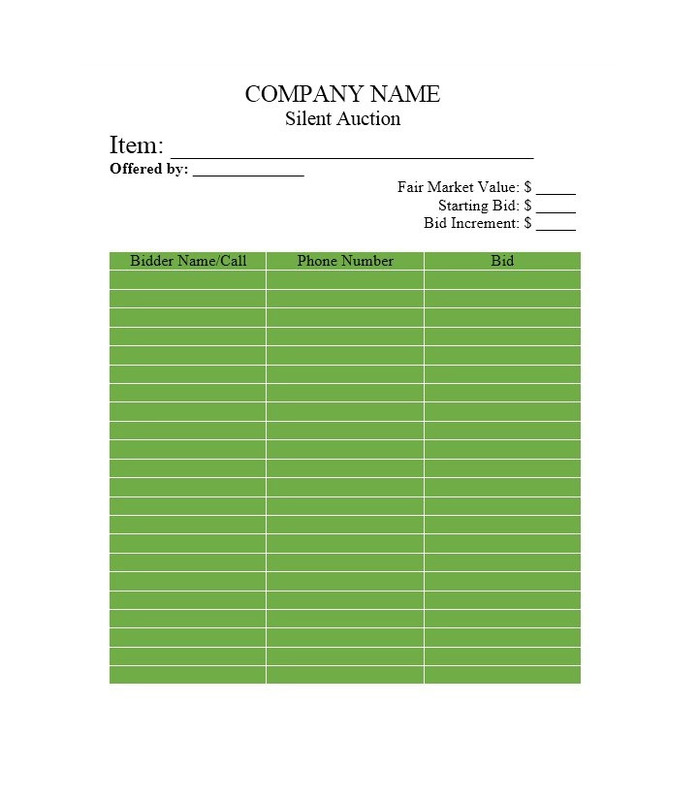 The name of the organization – Every bid sheet should add a logo and the name of the organization at the top. This encourages the donor to give their items and/or services because they know where the money will be directed to. Product Name and their description – Every product should have a short description. It should add all the details and information that a bidder needs to know like the expiry dates, exclusions, and location. Credits and commendation to the donors – By acknowledging the people who have given the stuff for the auction event, it will also encourage others to give their next time. Number/label the products for placing bids – Everything should have their tracking number that is distinct and unique from others. This is very crucial when dealing with similar products in such an event. The starting price of bids – Every product should have their starting price which is usually 40% of the market value. You can also add the “buy it now” amount for those who want to purchase it immediately. Don’t put all of them in one row. Enable the bidding from mobile phones, too. Have a ready desk for registering and signing all the bidders. Don’t put your items in a single table else they may look crowded. Use big fonts in describing your items. Provide several pens, papers, and glasses on your tables. Ensure your room is spacious enough to avoid crowding in a single place. Don’t put the bid sheets in a clipboard. Ensure the items are placed in the colored theme section. 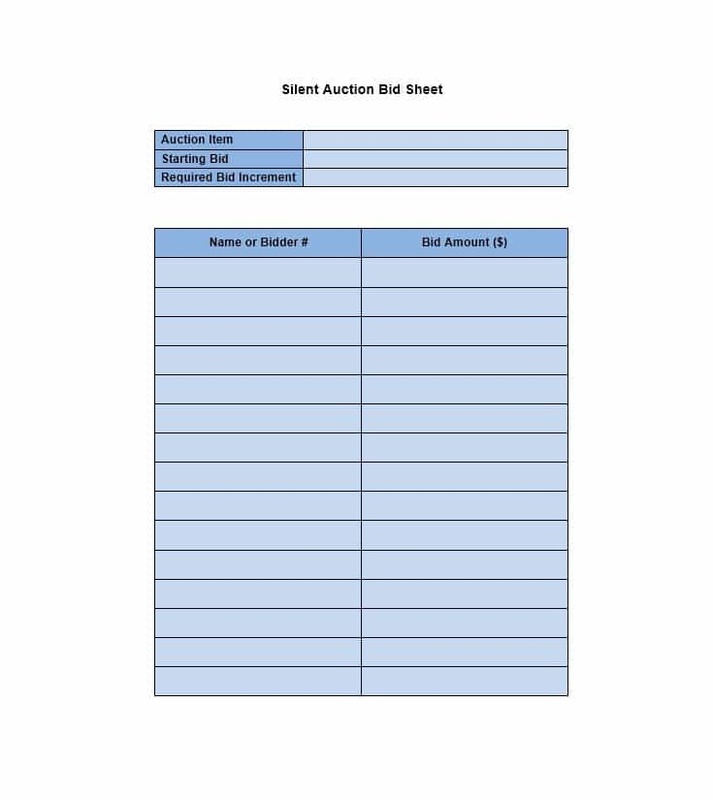 Now let’s look at some of the silent auction bid sheets templates that are commonly used by auctioneers which you can use too. 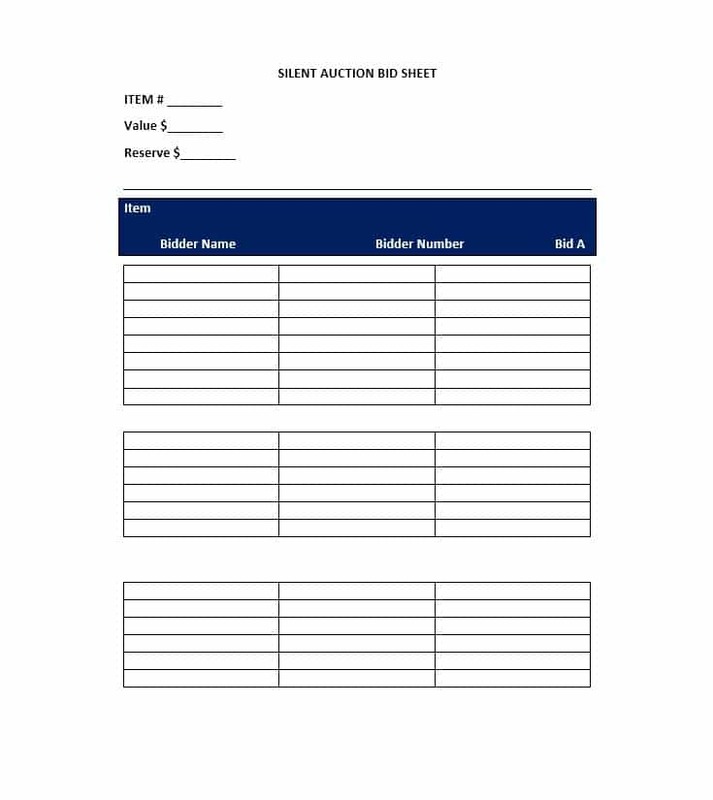 Having known the importance of using clear and well-labeled bid sheets in your silent auction, you can easily use one of the above and save your time and money. In case the buyers want it on a credit card recurring payment, you can use these credit card authorization forms to stay safe. Good luck with your auctioneering.